I am S-L-O-W-L-Y getting back to normalcy (whatever that is). For me, that entails getting back to routines. For example, I "usually" have a morning routine that includes reading a motivational passage, writing my gratitude list and then prayer and meditation. I just now got set up so that I can get back to doing that again. I am also S-L-O-W-L-Y getting this apartment in order, inside and out. You may recall that I enjoy bird watching. I wouldn't classify myself as a "birder" as I have never been on an official birding hunt, but I love watching them out my window and I look for them on hikes. I'm also quite proficient at identifying them by sight and sound. It's fun. 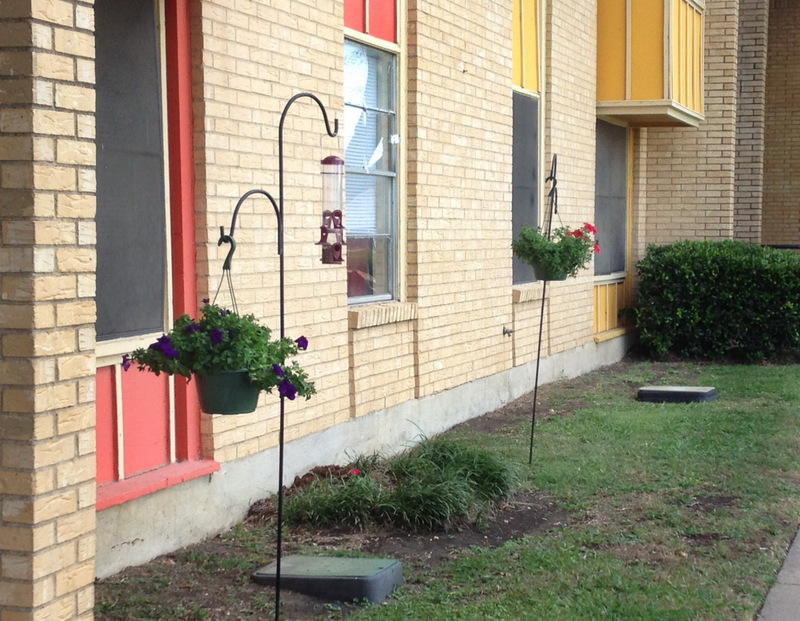 So it warms my heart that the manager's let me put up hooks outside my windows, and hang flowers and my bird feeders. Hopefully soon they will get a screen put back on my bedroom window. It still has the silver duct tape from the repair job when it got busted out. But see the bed of monkey grass and flowers? That was covered in debris, weeds and dirt. When I cleaned it up I found the monkey grass and added the flowers. It is looking better, don't you think? I'll keep plugging along and will soon be settled in completely. It strikes me as funny that I'm doing all of this "settling" so that I can be mobile one day. LOL. The sooner, the better. HugZ to you my wonderful readers! Thanks for being on this journey with me. @ Maria - thank you! I've been slammed for it so many times I forget to see it as an asset. HugZ! Settling in is part of making home anywhere! In an apartment or a moving house! Enjoy! Make the most of where you are! That's when joy comes! You know I've lived in my house for over 20 years and I sometimes feel like I'm still not settled....lol. 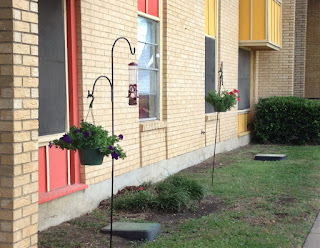 Nice that you were able to hang the flowers and feeders. @ Ann - I love your sense of humor and outlook on things. :) Yes, the flowers and feeders are HUGE bennie here, and I am very grateful for them. HugZ! It is good to settle in wherever you are. Even in an RV you have to settle in when you get to a new place. The first thing I do is hang out my flower (silk) baskets and patio rug. Inside or outside when you come home you want to "feel" that you're home. Who knows, maybe the flowers and feeders may incourage your neighbors to do likewise. @ Susan - kindred hearts are we. When I'm mobile I can see myself doing the same thing. I see that you are at a new gate and look forward to catching up with your awesome blog. I get lots of comments and compliments on the flowers - even from the kids around here which is especially fun. HugZ! Getting settled in is an ongoing thing when you are as mobile as I am!! Even if I'm just pulled into a rest area, there is a certain amount of settling in.....scoping out the area, noting where things are, etc....its all part of our lives! The hummingbird feeder will bring the little buggers in for sure! I am glad things are getting better & you are setting in.I will still keep you in my prayers.